In September 2018, Ports of Auckland Limited (POAL) in New Zealand signed a software service level agreement (SLA) with Konecranes for the new automated straddle carriers soon to arrive at their terminal. The SLA includes 24/7 software technical support once the new equipment goes live. The equipment covered by the software service level agreement was ordered in 2017. The order included 27 new Konecranes Noell Automated Straddle Carriers (A-STRADs) and 21 retrofits to manually operated Konecranes Noell straddle carriers that would make them fully automated. 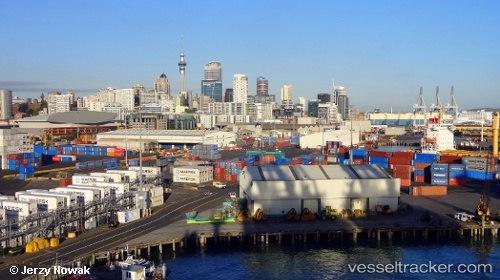 The New Zealand city of Auckland will soon be able to accommodate a higher number of large modern cruise ships after an agreement was reached to develop two outer dolphin mooring structures. The new structures will be located between 80 and 85 metres off the northern edge of the city’s Queens wharf. Once complete, the new structures will allow for more large 350 metre cruise ships to visit the city. When the dolphin mooring structures are in place, larger ships will be able to berth to the east of Queens Wharf. Plans are also in place to modify the port’s ferry terminal, which will ultimate enable cruise ships to berth on the west side of the wharf as well. The dolphin structures will be in place and available for the 2019/20 cruise season.